Want to know how it feels to fly the ASH 30 Mi, or what difference fitting the Front Electric Sustainer can make? Find out in the Oct/Nov issue of S&G, which also features top tips on how to use – not abuse – your radio, and an Airprox update sharing lessons learned to keep us all flying safely. 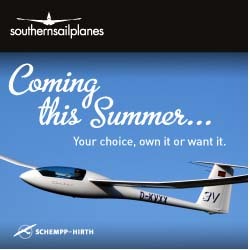 Schleicher’s new ASH 30 Mi was one of the star attractions at this year’s AERO in Friedrichshafen. Bernard Eckey, author of Advanced Soaring Made Easy, was thrilled to be given a chance to test-fly this new Open Class two-seater, just days after its maiden flight. Bernard usually flies an ASH 25 and he immediately felt at home in the ASH 30 Mi. Designer Martin Heide is confident that the ASH 30 will outperform the current generation of Open Class single-seaters over the entire speed range. Chris Nicholas has been enjoying flying his LAK 17A, recently returned from Slovenia with the Front Electric Sustainer fitted. It has already saved him from one field landing in Competition Enterprise, which he was able to enter without any crew. Although it is more expensive than a cheap glider and road retrieves, Chris concludes that, for him, this technology is the best compromise and a leading contender in the way forward for the future of cross-country gliding. We share the skies with many others and it can get busy up there. Hugh Woodsend has been analysing recent Airprox trends and shares some of the lessons learned to keep us all flying safely. Poor RT has been the cause of accidents. There are many reasons why, on the whole, glider pilots are pretty rubbish when it comes to using our radios. For many years we have had the freedom to operate radios on designated gliding frequencies. Protocols have been established, but many are ignored. There is nothing wrong in sounding professional in the air. Air Traffic Control instructor and Full Cat gliding instructor Peter Moorehead offers some top tips on how to use, not abuse, your radio. Also in this issue: BGA Chairman Patrick Naegeli reflects on a step forward with a reduced duration of the Olympics aviation security cordon. Alison Randle congratulates Yorkshire GC on becoming the first gliding club to achieve Sport England Clubmark accreditation. Roddy Maddocks tries out the upgraded BGA gliding simulator and finds it more realistic and easier to operate. Dr Peter Saundby and Dr Tony Segal advise how to deal with a potential spine injury in the event of a heavy landing or accident. Jane Nash reports from the 6th FAI Women’s World Gliding Championships in Sweden. We report on how the temporary Olympic airspace restrictions have been reduced, but still represent a challenge for gliding in southern England. Helen Hingley and Philippa Roberts tell us about their experience of entering Competition Enterprise for the first time. Iain Russell recounts how he took advantage of recent wave over Wooler to reach 20,500ft in his Skylark 4. A three-page Gallery Special features stunning photographs taken by Steve Lynn during his flight around the London TMA with Trevor Stuart. Lara Small reports from this year’sInter-Uni Task Week at Aston Down. Three young pilots explain how their flying experience has benefited from the award of an Air League scholarship. Mike Bird laments the continued gulf between the soaring record and the written record. Martin Simons reports from the 38th International VGC Rally, held this year in Austria. Jim Hammerton describes a BGA initiative to assist owners inkeeping Annex II gliders airworthy. 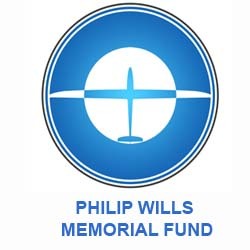 Vintage gliding news covers the Chris Wills Memorial Day, and the 16th Camphill rally. VGC secretary Bruce Stephenson explains how gliding has been accepted into the Wenlock Olympian Games from 2012. Derek Piggott reviews Bertha M Ryan’s book, Soaring Beyond the Clouds. The Gallery pages feature another selection of truly stunning images. Fly safely and have fun. 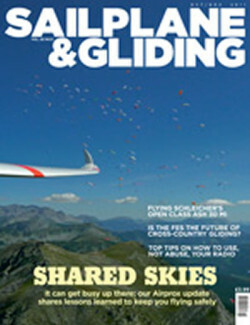 Extensive lobbying has resulted in the temporary airspace restrictions being reduced, but they still represent a challenge for gliding in southern England. How can we, as a gliding community, rise to the occasion? Return to the Olympic fold?